All stats are updated through the games of February 10. For up-to-the-minute coverage of this week’s college basketball action, visit us on Twitter and follow @PalestraBack. We’ve reached the peak of bubble season in college basketball. Games in early March will hold more significance for teams on the bubble, but right now, there are more teams with hopes of earning a bid and more opportunities for all of them to earn their way. This year, something feels particularly significant about the bubble conversation. The outdated RPI formula was scrapped in favor of the new NET metric, which appears to have flaws of its own. Beyond that, the teams on the bubble represent an interesting cross-section of the Division I landscape. The balance of power is teetering between the mid-majors and the power conference schools. The NCAA Tournament Selection Committee will face more decisions between middling teams from major conferences and the best teams from lesser conferences. In the past, the committee has shown a clear favoritism to the power conferences. Last season, just five of the 36 at-large bids were given to mid-major programs, and that is being aggressive, counting the American Athletic Conference among the non-powers. (The AAC is an odd fringe case, with a handful of big name programs and also the likes of Tulsa, Tulane, and East Carolina.) In 2017, mid-majors earned just four at-large bids. Dig further through the past decade and the story remains the same. The brand name schools from football conferences are given more benefit of the doubt. Once the tournament has started, we’ve seen mid-majors are fully capable of holding their own. In the last five tournaments, 31 mid-major teams have gone to the tournament thanks to an at-large bid. Those teams have combined for 20 wins in the round of 64 and beyond, with a 2-3 record in the First Four play-in games. Only five mid-major at-large teams in that time span have been upset by a lower seed. It should be noted, however, that these numbers are no compliment to the selection committee. Of the 31 teams I mentioned, just seven were not current members of the Atlantic-10 or American Athletic Conference. Those seven teams include notable programs like St. Mary’s, BYU, San Diego State, and Nevada. High achieving schools from lower perceived conferences have been essentially shutout for the last half decade. 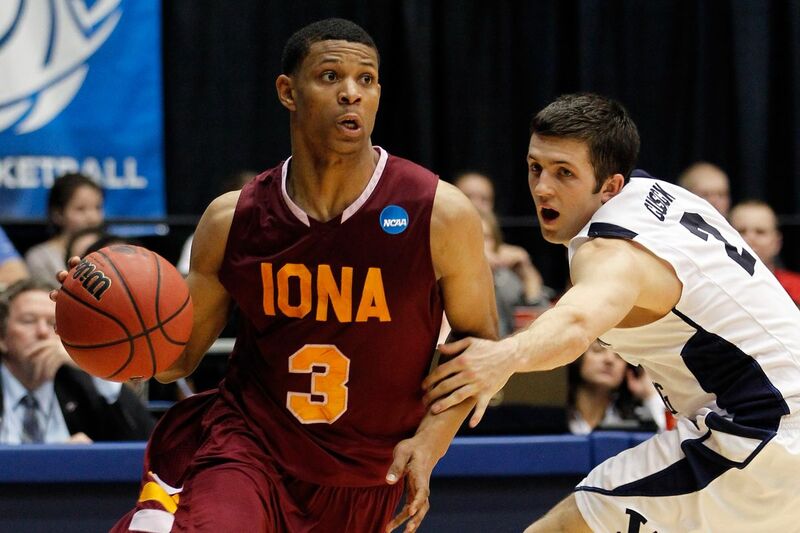 In fact, the last team from a conference ranked outside the top 12 by KenPom that particular season to earn an at-large bid was Iona in 2012. The Gaels, who were 25-7 entering the tournament, having played a top 50 strength non-conference schedule, we treated to a trip to Dayton to play fellow mid-major BYU for a shot at a 14-seed. This year, this fight could be more contentious than ever. The Pac-12 is an outright garbage fire. The middle of the SEC is a slopfest. The Big East currently has two teams with a winning record in conference, thanks to some legendary cannibalization by a group of five teams all sitting at 5-6 in league play. That means the bubble is populated by teams treading water in less than stellar conferences. Right on their heels is a pack of mid and low-major teams hungry for an at-large bid. For whatever reason, this season features an influx of afterthought conferences that have not just one strong team worthy of tournament attention, but two or three. 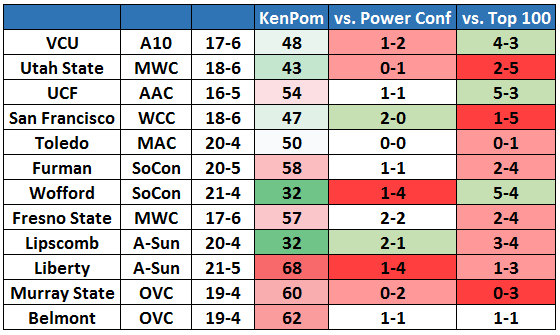 Little respected conferences like the Southern Conference, Ohio Valley Conference, Atlantic Sun, and Mid-American Conference have multiple teams in the top 70 per KenPom. The Mountain West and West Coast Conference each have three top 70 teams. This March, eeking out a .500 mark in a power conference should not cinch up an at-large bid for anyone. Failing to even achieve that low bar should be absolutely disqualifying. Based on recent history and current scuttlebutt, that doesn’t seem to be the case. 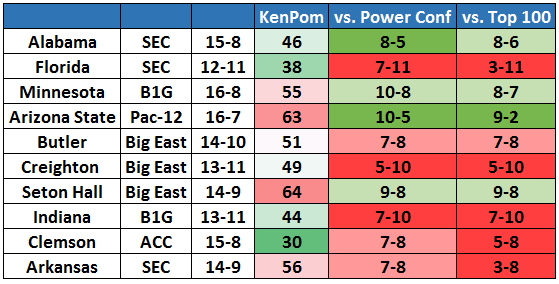 I have included their KenPom ranking, as well as record versus power conference foes and the KenPom top 100. This exercise certainly helps the case of some on the bubble. Arizona State has looked the part against tournament level competition. The Sun Devils sit on the bubble, however, thanks to six losses to teams outside the top 100, including home slip-ups versus Utah, Princeton, and Washington State. Ew! Meanwhile, a team like Florida inexplicably remains part of the tournament conversation. The Gators have played the third toughest schedule in America, and that does deserve recognition. That being said, against that schedule, Florida has had plenty of chances to show itself capable of winning games against tournament level competition and have failed to do so time and time again. Their three wins versus top 100 teams are barely noticeable. The Gators needed overtime to beat Ole Miss at home. They won at Arkansas and won a home game against a Butler team that beat Florida earlier in the year on a neutral court in the Bahamas. Creighton and Arkansas and Clemson have all done much of the same. These teams had their chance to impress and they haven’t, at least not as often as they’ve disappointed. Finally, there’s Indiana. The Hooisers already have 11 losses this season and have dropped 9 of their last 10 games. Yes, the one win in that group was a victory at Michigan State. But just because Indiana’s peak performance was impressive means their expected tournament outcome should be anywhere close to that level. A single upset win does not clear away the blemishes of the rest of Indiana’s season. Now, some or many of these teams will earn their way into the Big Dance thanks to a conference tournament wins. Yet those who share a conference with another tournament worthy team, will be forced to the outside, looking in if they stumble before earning the automatic bid. And that shouldn’t be the case. Clearly, these numbers don’t jump off the screen at you. None of them play elite schedules – because they can’t. Mid-majors aren’t blessed with home games against good teams that they can use to pad their resume. Even in the non-conference, major powers rarely look to schedule strong mid-majors and most would be caught dead before playing in the home gym of a small school. But this list of teams has shown themselves worthy when given chances. VCU, Wofford, and UCF all have not just winning records against the top 100, but more wins versus that level of opponent than Florida or Arkansas. Lipscomb and Wofford each boast two road wins versus top 100 teams. Florida has just one. These teams will dance around a minefield for the next month, trying to avoid the dreaded bad loss that could doom them. Many will see their entire season come down to their conference championship game. Meanwhile, the dreck in the middle of every power conference will stumble through their schedules, picking up wins and piling up losses. For the sake of our entertainment and the competitiveness early in the NCAA Tournament, we can only hope that the committee will see this issue from the right point of view. Let the little guys in. Fill the dance with Cinderellas. They have earned their chance and deserve a moment in the spotlight.